The basis of our philosophy is to guarantee to you, our guests, a unique holiday experience respectful of our countryside: it is the town itself, in fact, that opens itself to welcome travellers into its community and makes them feel, to put it briefly, at home. The central structure is the heart of a cosy hotel, originally a monastery dating from around 1200: its comfort is derived from the breakfast room, filled with light, restored from the old kitchen of the original building, where every morning tasty and wholesome breakfasts are served. In addition, the central structure reserves for its guests, in the reception areas, a little Bistro corner, a well-stocked library, called “The History Room”, in which they can relax with a good book, and above all, the verdant terrace garden bathed in sunlight, where the ancient vegetable garden of the monks once grew. The bedrooms are furnished with taste and character, suggesting an atmosphere of romance and warmth, with attention to the smallest details, from the four-poster bed to the simple and refined furniture. Situated around this 3 star hotel, no further than 300 metres away, other rooms are managed with the same care and attention: in choosing one of these rooms, whilst not forfeiting the comfort you would find in a traditional hotel structure, you can take advantage of the added value of living the real life of this charming location, just as the locals do. 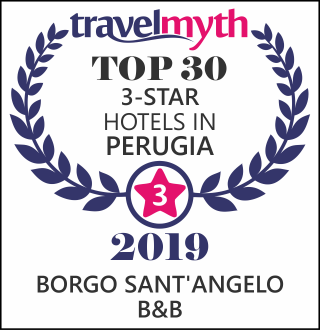 Giving you the choice between bed and breakfast, half-board or full-board, “Borgo Sant’Angelo” is ideally placed for those who want to discover Umbria in depth: the area around Gualdo Tadino is rich in natural and artistic beauty. In addition, it’s only a few kilometres from some of the region’s most interesting and lively towns: Perugia, Gubbio, Spoleto and Assisi, with their fascinating history and their great beauty, are easily accessible. Every detail has been considered for a carefree and enjoyable stay: the hotel has parking 100metres away and there is free wifi for guests, both in the bedrooms and the reception areas.